When you think of a Middle Eastern-Mediterranean cuisine mash up? What’s the first food that comes to mind? We bet you it wasn’t cheese. What if we told you that a local cheese board was a staple of Egyptian cuisine? Or that we had have the Egyptians to thank for cheese itself?! Cheese jars and hieroglyphs (the O.G. emojis) have been found in tombs dating back earlier than 3000 B.C. Now that’s some stinky cheese! Egyptian food isn’t all dairy-based, but it is a part of their heritage that Egyptians have been cultivating for years. 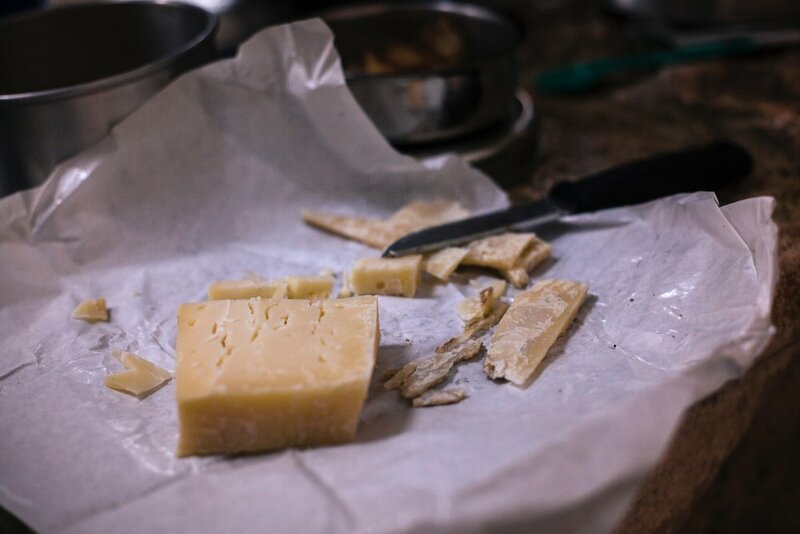 Many people still make their own cheese at home. Cheeses aside, you will find the Egyptian diet very vegetarian-friendly, though grilled lamb and beef, as well as fish and duck along the coast are popular depending on dietary and religious preferences. Just be certain that that fast food sandwich you ordered in the city is truly what you want to take a bite of. Liver and pepper sandwiches are quite popular on-the-go meals during hectic afternoons. With a delicate, but gamey taste, liver is quite distinct on the palette. It’s also high in protein and B vitamins. If liver isn’t your speed, we recommend going a little more veggie heavy. A traditional Egyptian meal can be as simple as fresh baked pita and lentils or fava beans seasoned with cumin and other native spices. All in all, there’s something for every foodie in Egypt, and with so many holidays revolving around breaking of fasts, food culture is quite celebrated in the country. Meals are joyous occasions and meant to be enjoyed over long hours of conversation and plenty of cups of tea. If you happen to visit the home of an Egyptian, or even certain businesses, tea is a compulsory preparation for a guest. (Think of it like a mandatory glass of water.) This courtesy is a sign of respect and should not be turned down. If your hosts are feeling extra welcoming, you may even be served some sweets like, baqlawa (Egyptian baklava) or ghorayiba, an Egyptian shortbread cookie. Those that say Egyptian food is underwhelming are ignoring the context of Egypt’s location and rich history. On the continent of Africa, seated at the bountiful Nile basin, just a relatively short sail from Greece and Italy’s influence and connected to the Middle Eastern peninsula, Egypt’s richness comes from those that surround it and what it chose to do to combine those flavors. Perhaps its recipes are simple, but they are far from lacking in flavor and culture. Why not try it for yourself? Koshari is one of the unofficial and widely eaten meals of Egypt. Served as a complete meal, this dish could easily be the only thing on the table at your next dinner party (after the cheese board, that is). With a distinct melding of Italian and Middle Eastern ingredients, we guarantee you’ve never had anything like it. Make the crispy onion topping. Sprinkle the onion rings with salt, then toss them in the flour to coat. Shake off excess flour. In a large skillet, heat the cooking oil over medium-high heat, cook the onion rings, stirring often, until they turn a nice caramelized brown. Onions must be crispy, but not burned (15-20 minutes). In a saucepan, heat 1 tbsp cooking oil. Add the grated onion, cook on medium-high until the onion turns a translucent gold (do not brown). Now add the garlic, coriander, and red pepper flakes, if using, and saute briefly until fragrant (30-45 seconds more). Stir in tomato sauce and pinch of salt. Bring to a simmer and cook until the sauce thickens (15 minutes or so). Stir in the distilled white vinegar, and turn the heat to low. Cover and keep warm until ready to serve. Cook the lentils. Bring lentils and 4 cups of water to a boil in a medium pot or saucepan over high heat. Reduce the heat to low and cook until lentils are just tender (15-17 minutes). Drain from water and season with a little salt. (Note: when the lentils are ready, they should not be fully cooked. They should be only par-cooked and still have a bite to them as they need to finish cooking with the rice). Now, for the rice. Drain the rice from its soaking water. Combine the par-cooked lentils and the rice in the saucepan over medium-high heat with 1 tbsp cooking oil, salt, pepper, and coriander. Cook for 3 minutes, stirring regularly. Add warm water to cover the rice and lentil mixture by about 1 1/2 inches (you’ll probably use about 3 cups of water here). Bring to a boil; the water should reduce a bit. Now cover and cook until all the liquid has been absorbed and both the rice and lentils are well cooked through (about 20 minutes). Keep covered and undisturbed for 5 minutes or so. Now make the pasta. While the rice and lentils are cooking, make the pasta according to package instructions by adding the elbow pasta to boiling water with a dash of salt and a little oil. Cook until the pasta is al dente. Drain. Cover the chickpeas and warm in the microwave briefly before serving. To serve, fluff the rice and lentils with a fork and transfer to a serving platter. Top with the elbow pasta and 1/2 of the tomato sauce, then the chickpeas, and finally 1/2 of the crispy onions for garnish. Serve, passing the remaining sauce and crispy onions separately.